With the IOT wave sweeping over the world, the technology space is also quite upbeat about various network solutions taking over. Comes into picture, the class of low-power and long-range networks is referred to as LPWAN: low power wide area networks. Like Wi-Fi and Ethernet, they have star network topology, which helps to reduce power consumption. Data can be directly fed into the network from a central point, eliminating the need for power sipping devices transmitting through a mesh. Although various other LPWAN technologies are also in use, LoRaÂ has been the focus of especially intensive attention of late. 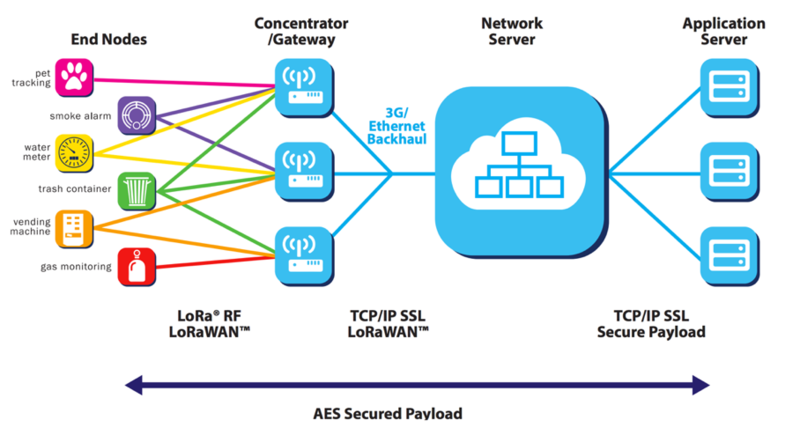 LoRaWAN is also based around the use of nodes (also referred to as motes), gateways that â€“ similarly to Wi-Fi access points â€“ pick up signals from the air and convert them, and a network server (an entire distributed infrastructure, in some cases) that effectively serves as data bridge to the application. The data transmitted by a node can be simultaneously picked up by multiple gateways, while encryption keys ensure that the network will accept the message and the application can process the decrypted data.Â In another special feature, LoRaWAN also allows for data to be transmitted to sensors. Amongst other smart features, LoRaWAN allows for varying speeds: the spreading factor (SF). Devices with a low spreading factor communicate more rapidly and use less airtime, but have a smaller reach. Despite slowing down transmission speeds, a higher spread factor will ensure that your message is received clearly over a greater distance. The LoRaWAN specifications also incorporate ADR: adaptive data-rate, whereby the network can advise your device to use a lower spreading factor if the signal is strong enough: this saves air-time, and enables you to send more data in less time in order to conserve energy. With less airtime per node, the network can accommodate a greater number of active nodes. Definitely an emerging field of study and innovation. Great writeup.